With only 8 buttons Torq-Tronics2® is amazingly simple to operate! The 'Power Tool' mode has ten filters and will accurately test all clutch type and pulse tools. Memory stores up to 999 records that can be downloaded to hyperterminal / terminal program to create testing reports and data storage. Accuracy of +/- .5% of Indicated Value from 10% to 100% of rated capacity. Meets or exceeds requirements of ASME B107.300-2010. Red/Green LED indicates whether a measurement is within the target torque value. Overload (120% of capacity) warning is built in and all torque readings are recorded. If unit has been overloaded and turned off, the VFD brings up the incident that caused TT2 to be in an overload situation. Record data stored in two separate places and cannot be erased and data is stored even if unit memory is turned off. Sturtevant Richmont Torq-Tronics 2 Digital Torque Tester. 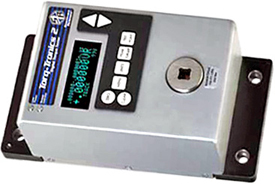 Model: Torq-Tronics 2 600 Description: Digital Torque Tester 814 Nm / 600 in.lb Drive: 3/4'' F Sq.